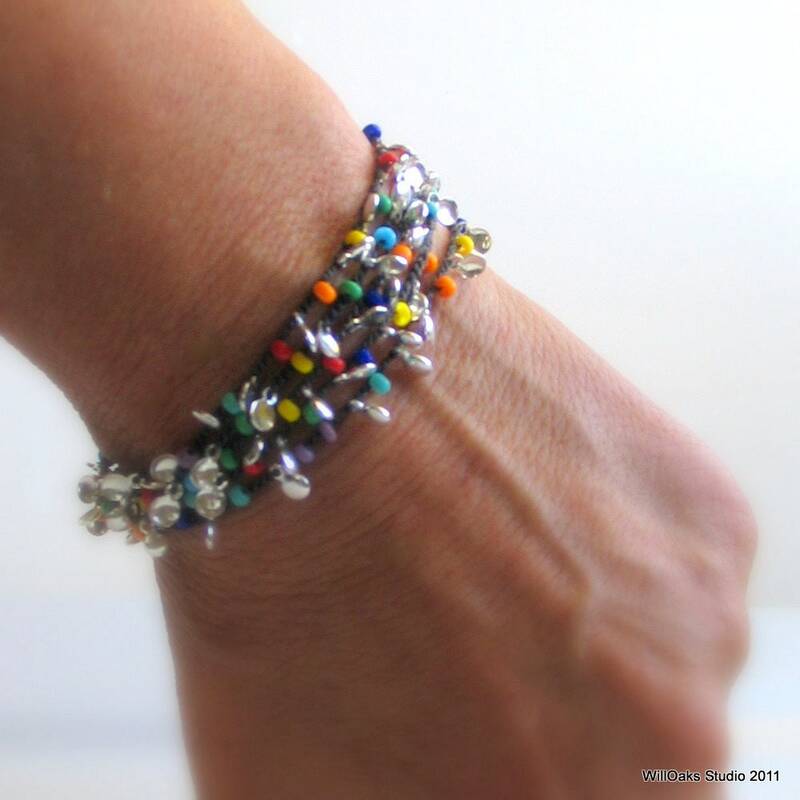 A rainbow of Czech glass beads and charcoal gray silk fiber as a long chain wrap cuff with tiny polished silver drops and glass seed beads. My silk creation is about 32" long to wrap your wrist 5 times, to use as a double wrap necklace or to wear as a long and flowing chain. The tiny round silver plated brass drops playfully catch the light mirror-like, both singly and all clustered together. 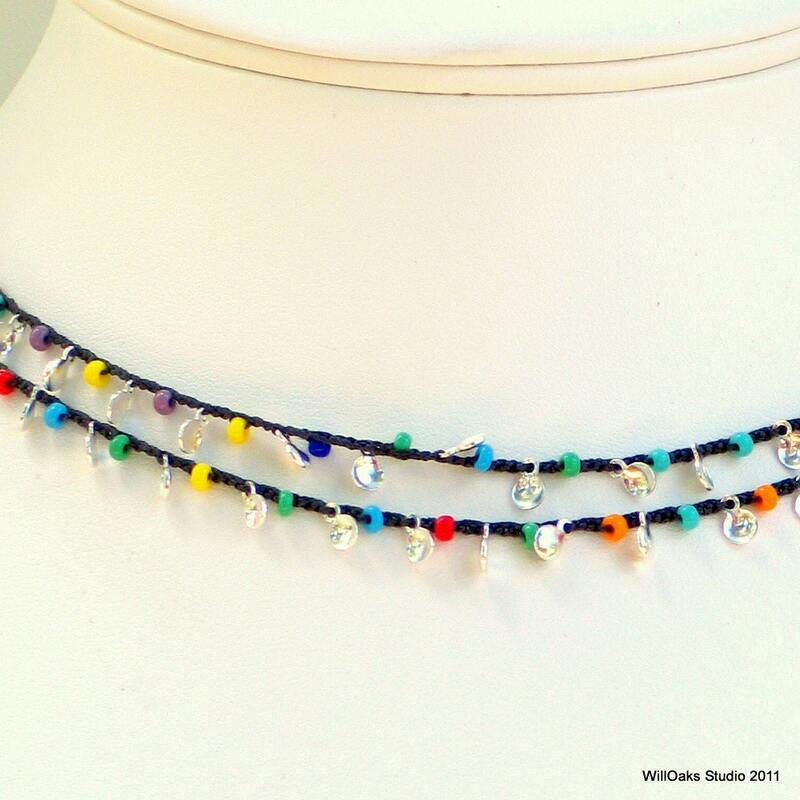 Dainty, colorful and totally comfortable, I love my new design as a choker worn doubled at about 16" or of course, long and flowing as a simple chain. It closes with a silver spring clasp and ring. 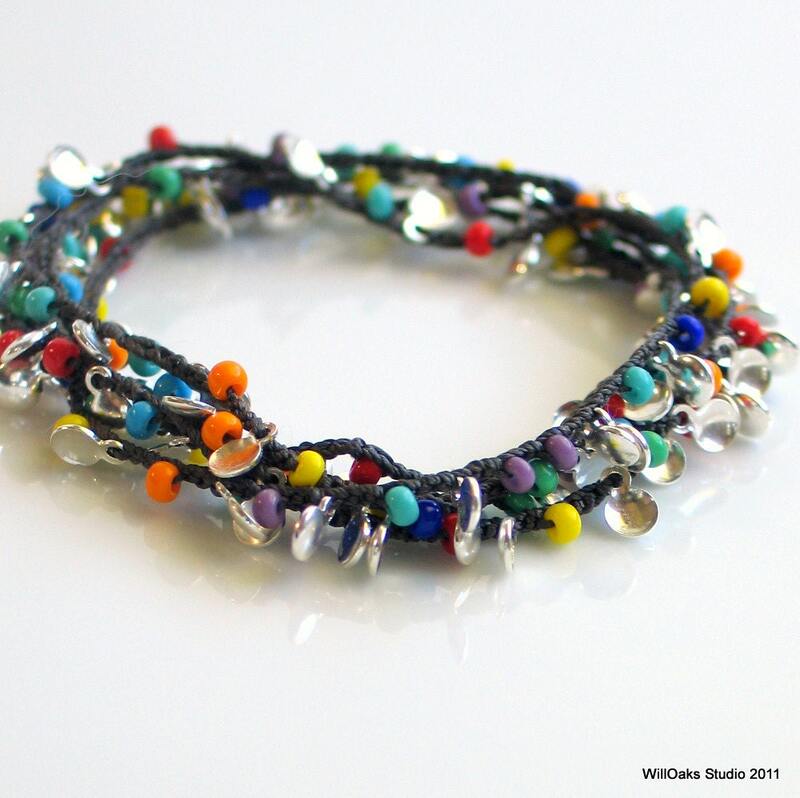 Used as a bracelet, it's light as a feather and easy to forget you're wearing it. This top quality, American made jewelry silk has a beautiful drape for a necklace that will work with many necklines and will layer with numerous other pieces, including some of the pieces here in my studio. Easy to wash and dry, too, so maintenance is simple: hand washable with mild soap, rinse well and then hung with a bit of weight to dry. 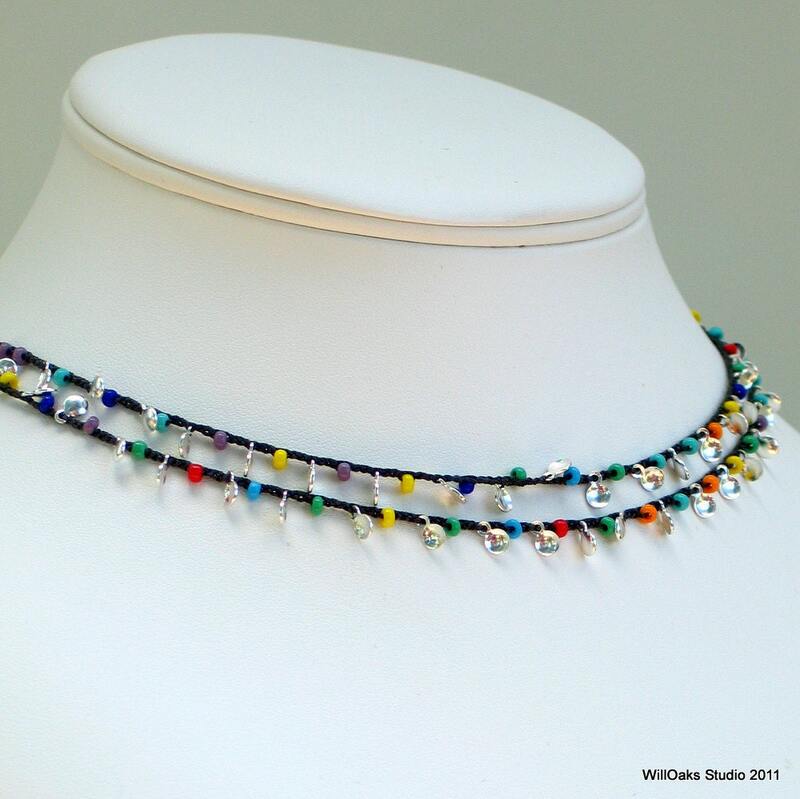 The Czech glass beads are bright primary rainbow tones, opaque with a shiny finish. Tiny metal disks about 1/8+" or 4mm in diameter are tiny domes of brass that has been plated with silver. Because these tiny disks are able to easily rotate while captured within the crochet silk chain, they do not poke when worn but rather, lay smoothly and comfortably. 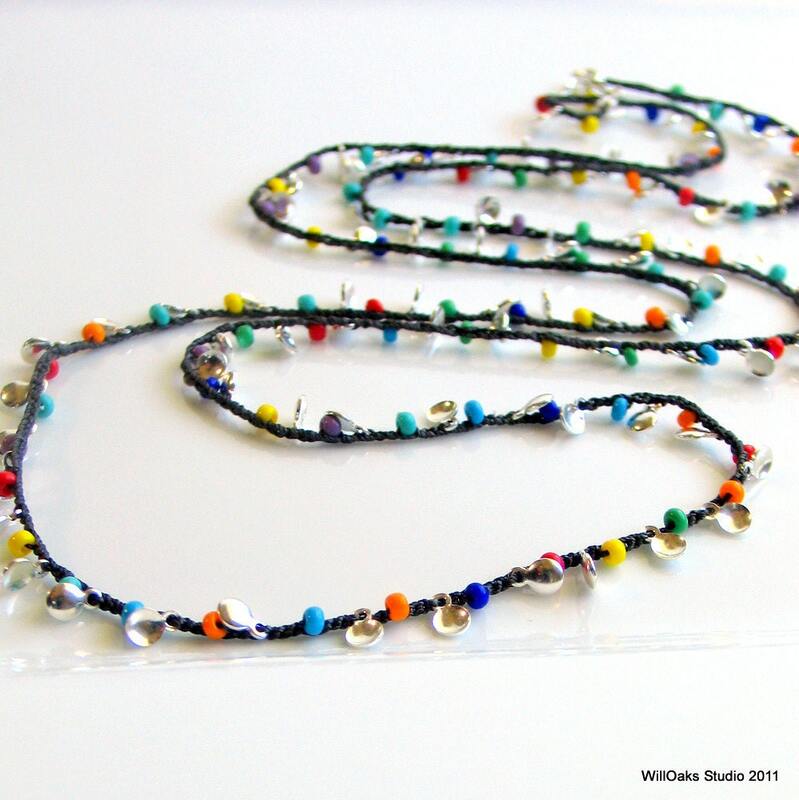 WillOaks Studio "Made With Silk" crocheted jewelry pieces are packaged in velvet bags for giving and for storage. Adjustments to length are possible when a piece is ordered. For example, with this design, if you plan to wear it as a cuff, please include your wrist measurement in "notes to seller" and I will make length adjustments to be sure a series of nice, complete wraps can be easily and comfortably done. Thanks for stopping by--do visit the front window of my studio here https://www.etsy.com/shop/WillOaksStudio and please stop by again soon! Really fun piece, and very professional artist! Absolutely love this!! Lots of compliments too! Really fast delivery, beautiful bracelet, so happy with it thank you! !